Once, I emailed my co-worker to ask if he was free for lunch and wanted to grab wonton noodles with me in Chinatown. "Sure," he wrote back. "But I take my lunch at 1 pm - is that too late for you?" "???" I replied. "Your lunch seems to run from 10 am - 4 pm," he wrote. "Every time I come up to your office, you have food out on your desk during those hours. It's nearly a 24/7 spread." "I SNACK," I wrote back faux-angrily. "It's called GRAZING," I faux-fumed. "You should eat a more substantial and slow-releasing energy breakfast," advised another colleague. "I make myself a bowl of steel-cut oatmeal every morning with a generous helping of almonds, walnuts and a handful of goji berries." "Mmm hmm," I nodded, scribbling down notes while wiping away a remnant of Nutella smeared on my pinky - evidence of my cinnamon and raisin bagel breakfast habit. My snacking is also somewhat compulsive. The nature of my job means that I spend a lot of time problem solving or explaining things to people or writing long, angry emails (AKA negotiating). And when I'm deep in concentration, I tend to snack. Or chew gum. Enter the Graze box: for £3.49, this compact little box with four compartments filled with different varieties of snacks that you choose arrives at your office desk once a week or as often as you'd like. Skeptical, I paid a visit to yet another co-worker, whose husband had given her a Graze subscription as a present one year. She loved them. And since Graze was running a promotional deal where you can get your first box free and your next box half price, I decided to try it. 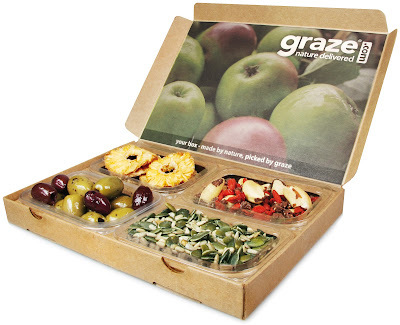 Graze gives you the opportunity to choose what kind of box you'd like: 1) a "Nibble Box", which gives you maximum variety and is no-holds-barred when it comes to what kind of snacks you get (yes, it includes the occasional piece of chocolate in the form of, say, a chocolate button) 2) an "Eat Well Box", which includes strictly healthy foods and the occasional "treat" 3) the "Boost Box", which is the strictest, most nutritional box that consists of nuts, seeds, and maybe dried fruit and 4) the "Light Box" which contains low calorie nibbles. You can guess where this story is going, right? I started with the "Boost Box". New year, new me, right? Then, my face fell when I realized that, duh, I couldn't get chocolate buttons in the Boost Box. So then my finger hovered over the Eat Well Box. Nixed that idea in about 2 seconds. Then the Light Box. Finally I gave up and just headed over to the Nibble Box. You can choose what snacks you "love", "like", want to "try" or simply "bin" (AKA never have it delivered. EVER.). Click, done.